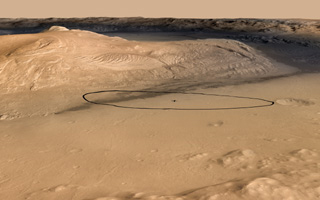 As Curiosity hurtles toward its landing site at Gale Crater, the Entry, Descent, and Landing team has taken center stage. But once the roving begins, Curiosity will come face to face with the rocks and soil that, hopefully, will tell the story of Gale Crater's watery past. With the impending surface operations phase in mind, the science team has used the eerie calm before the storm to take a closer look at the landing site terrain. It has been an exercise in scientist crowd-sourcing, as Mars Science Laboratory Project Scientist John Grotzinger tasked the Mapping Working Group with developing a detailed map of the final landing ellipse. 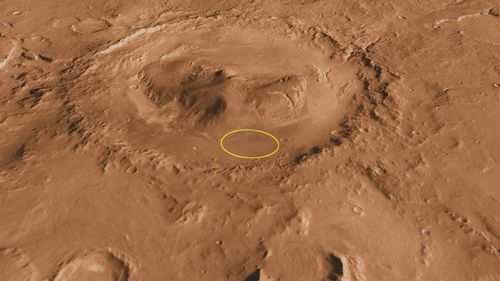 This oblique, southward-looking view of Gale crater shows the landing site and the mound of layered rocks that NASA's Mars Science Laboratory will investigate.